We're launching a new seminar series aimed at helping grow small farms in our area and innovative food entrepreneurs world wide. If you know people who may be interested in food entrepreneurship and sustainable ag, please forward this link. We'll do the first two seminars in the beautiful growing regions of Southern and Western Wisconsin in early March. Join us if you can. Then we'll move them online. If you are out of this region, sign up for newsletters and future online seminars below. The idea is that there are many great small farms looking to grow and diversify their enterprise. There are also many great food entrepreneurs worldwide who need new opportunities. 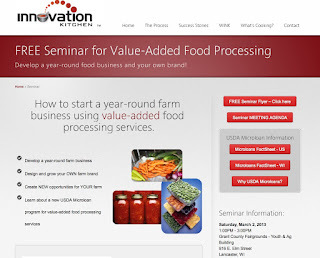 Farms in our region and food entrepreneurs worldwide can utilize the safe, legal, food processing capabilities of community based food processing kitchens, starting with the Wisconsin Innovation Kitchen in Mineral Point, WI and the Food Enterprise Center in Viroqua, WI. The Innovation Kitchen model represents a valuable response: Safe, certified commercial kitchens offering professional food processing services, community employment, and business development support. You can sign up for our newsletter and future online seminars using the links below. The Innovation Kitchen model can help with important parts of this discussion. Like the Innovation Kitchen on Facebook to keep in touch. Choose Your Own Food Adventure - "It's time to dream"
Safe, year-round, value-added, regional foods. It's a good idea. There was a nice article in last weekend's Wall Street Journal about some of the ways authenticity in foods is being celebrated. I loved the title: Choose Your Own Food Adventure. I also loved the closing of the quote below, "It's a great time to dream." If you want to participate in an another kind of authentic food adventure, we're presenting new seminars in March about ways small farms can build their businesses to serve the demand for regional foods. "Recognizing that authenticity has replaced luxury as a culinary watchword, a new crop of companies has sprung up to indulge this heightened craving for epicurean adventure. They offer direct access to the most influential chefs, food journalists and food artisans, as well as introductions to talented home cooks, bloggers and local foodies in the world's great food cities. In some cases, offerings can be crafted and customized; in others, they are already tailored to desires so specific you might not yet realize you have them... It's a great time to dream." Access to professional value-added food processing services can be a vital driver for regional economic development. Local foods create regional vibrancy.